10 years ago in 2006 when I purchased my fully loaded first-generation Toyota Camry Hybrid, I was luck enough to have their fancy touch screen navigation. Even today, Toyota/Lexus has a technological lead regarding in-car entertainment systems compared o their automotive peers. But as technology advanced, competition now come in the form of data enabled smartphones S(both Android and iPhone). I'm personally an Android user, so I'll focus there. How you control your entertainment from you car is a lifestyle choice, and says a lot about your personality. All your personal information is already local to your phone. No need to sync contacts, text messages, and emails back and forth. Most smartphones very high powered specifications. One thing I noticed in modern cars is the UI of some in-car infotainment systems can be laggy. That can be a dangerous thing, especially while simultaneously operating a car. The average smartphone user already swaps out for a new smartphone every 2-4 years to keep up with the changing technology. Do anyone expect the infotainment hardware in your car to last 10 years? 5 years? Can easily mount your phone to your car via magnets. So even though making your phone visible is an added step, the magnetic car mount has drastically improved the process. This makes for easy attaching and detaching. You can take advantage of that expensive cell phone bill you're already paying for with Verizon, ATT, Sprint, or T-Mobile. Screen size is limited to the size of your phone. If you have one of the larger screens, this isn't as big an issue. Smaller phones can be more dangerous to use, as everything on screen is simply smaller. Any controls built into the car won't work. For example answering a call from buttons on the steering wheel. Battery is limited, that is unless you snake an unsightly charging cable to a USB port or cigarette charger. Even then, is that USB port or cigarette charger pushing enough current to keep your phone charged while you're using Bluetooth and navigating maps with GPS? Built in car infotainment systems don't have this issue. While your phone is under heave usage, if it also happens to be in direct sunlight, you'll find your phone overheats. This may either degrade performance or shorten the lifespan of your battery/smartphone. There's always the option of purchasing an aftermarket infotainment system. Big name manufacturers like Pioneer, Kenwood, and Alpine all make systems. I started looking into this as a potential solution, as they have aftermarket infotainments systems that support both Android Auto and Apple CarPlay. But after a very short amount of research found that messing with any components of the car as central as the infotainment system may cause issues in other parts of the car. Common examples are how cars display the backup camera and other built in sensors to the car. The upside here is the aftermarket infotainment system can be much larger than your phone, should hopefully take advantage of steering wheel controls, and no worries with keeping the system charged. The biggest issue is the technology may become obsolete before you car and you'll most likely have to pay for both the infotainment system and a technician to install it. Not to count out car manufacturers are coming out with state of the art infotainment systems. The best ones that come to mind are from Tesla, Audi, and Volvo. The issues here is that many of these system are only available on luxury brands that are out of reach for most people . Tesla has large screens built into every one of their cars. Audi is slowly rolling out Virtual Cockpit on their cars, which is nothing more than a high quality screen that covers the dashboard's unique shape (no longer a rectangle). The Volvo in their highest end SUV has a nice large screen with all sorts of information. However, not all car manufacturers are innovating at the same pace. 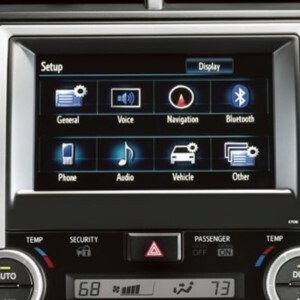 On my recently purchased Toyota RAV4, I've noticed the screen is smaller, the responsiveness is slower, and the UI is slightly more confusing to navigate because there are so many options.